One can imagine a reluctant young writer easily getting caught up in the fun and effortlessly recording a series of exploits in answer to those of the young dog-owner narrator. The book’s loose story line is based on the narrator’s preparations to enter his beloved mutt in the esteemed Battle of the Breeds competition. He resents the attention given proper breeds and consequently makes up a breed by combining two parts of official names (and encourages us through an exercise to do likewise). Instructions for teaching tricks such as shaking hands, spinning, and taking a bow quickly disseminate into more laughs when we’re asked to rate our dog’s progress. The featured “amazing” dog’s best trick is “expert couch space taker upper.” Most Ear-resistable Ears and Best Kisser are two of the suggested competition categories when holding your own neighborhood dog show. Among the other discovery-laden exercises readers are encouraged to do is imagining the dog park of their dreams, which may include the following amenities: a photo booth; a constant stream of postal workers, and a cat in a cage. In another, readers are challenged to have their pooches write us a letter: “If you were my pet, I would let you…” Fun factoids scattered throughout include information like George Washington owned over twenty-five foxhounds, and dogs do see in color, but duller than we do. In the book’s only disconnect, a photo of a different dog opens each of nine chapters, even though we’re not following his or her story. After the “amazing” dog of the title takes a dump in front of the judges at the competition, he wins “Best Personality” and a series of obedience lessons. 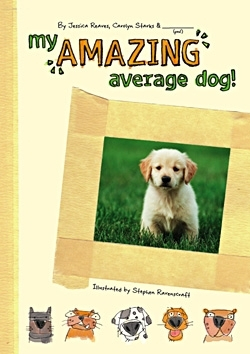 Ultimately it’s determined that it might be “better for all the dogs if he was tutored at home.” The sweetest lesson conveyed by this innovative and guileless book is that “average” can be pretty great, after all.